The Korowai tribe of south-eastern Papua is thought to be one of the last surviving tribes in the world engaging in cannibalism. Obviously, cannibalism is deeply rooted in their culture. Do we therefore allow it to happen? The Mayans, just a few centuries ago, made human sacrifices to their gods. They tore the beating hearts of their victims out of their chests, before they decapitated them. This practice was deeply rooted in their culture. Would it therefore be acceptable to let it continue today? Early Christians stoned female adulterers to death if they got caught. Being passed down from the Old Testament, this law was deeply rooted in the Christian culture. Do we stone adulterers today? I think the Japanese Prime Minister should have more sense in 2014 and set an example that his nation can be proud of. 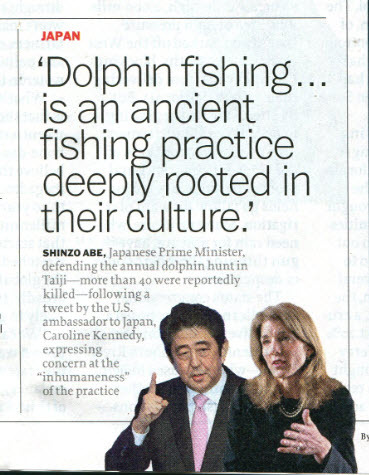 The Japanese should stop hunting dolphins and whales. Are Orcas more Human than Humans? We used to slaughter the American Bison on the great plains too, should we still be doing that?